b. Was 9/11 an update of the Pentagon-approved “Project Northwoods” plan for conducting self-inflicted, false-flag terror attacks in the United States, and blaming them on a foreign enemy? a. The record of criminality and sponsorship of coups around the world by the covert networks based within the US intelligence complex. b. Specifically also: The evidence of crime by Bush administration principals and their associates, from October Surprise to Iran-Contra and the S&L plunder to PNAC, Enron/Halliburton and beyond. Operation Northwoods was a proposed false flag operation against the Cuban government that originated within the U.S. Department of Defense (DoD) and the Joint Chiefs of Staff (JCS) of the United States government in 1962. The proposals called for the Central Intelligence Agency (CIA) or other U.S. government operatives to commit acts of terrorism against American civilians and military targets, blaming it on the Cuban government, and using it to justify a war against Cuba. The plans detailed in the document included the possible assassination of Cuban émigrés, sinking boats of Cuban refugees on the high seas, hijacking planes, blowing up a U.S. ship, and orchestrating violent terrorism in U.S. cities. The proposals were rejected by the Kennedy administration. FOR THE RECORD. New York City Mayor CIA agent Warren Wilhelm aka Bill de Blasio, is Mr. Cleanup Man, if Mormon CIA succeed in executing their planned attack on the Hudson River, a nuclear bomb attack from Exchange Place to Port Authority Bus Terminal on the New York side of the Hudson River, and from Exchange Place in Jersey City, Hoboken and Weehawken on the New Jersey side of the Hudson River. Updated: Sept. 5, 2011 10:54 p.m.
Brent Belnap in New York City. Ten years later, Brent Belnap remembers the surreal events of 9/11 as if it were yesterday. The crystalline blue skies. The smell of burning rubber. A strange nudge in the back. A thick cloud of ash that turned day to night. Resumes falling from the sky. Apocalyptic scenes of ghosty figures walking like zombies through the desolation. Like millions of others around the country, Belnap will reflect on the events of 9/11 this week as the 10th anniversary of the terrorist attacks on the World Trade Center is marked Sunday. He was in the shadow of the doomed WTC that morning and exhibited the kind of quiet, unsung courage that came to definite the tragedy. Like a ship’s captain, he didn’t abandon ship until he had seen to the safety of his crew. Belnap, who grew up in Ogden and graduated from BYU, was working on Wall Street at the time as a lawyer for Citibank, his office just a few minutes’ walk from the World Trade Center. He also was — and this is relevant to his story — president of the New York New York Stake for The Church of Jesus Christ of Latter-day Saints, which included nine wards and two branches in Manhattan. Belnap was riding the subway when he felt a jolt during a stop at Fulton Street. The other passengers felt it, as well. What was that? He saw a panicked woman run onto the train, but she said nothing. “As we were sitting there, there was the unmistakable smell of rubber,” says Belnap. He disembarked at the next stop, and as he walked out onto Broadway and Wall Street he smelled burning rubber again and noticed paper fluttering down out of the sky. It’s only September, he thought to himself; the Yankees couldn’t have won the World Series, so it can’t be a ticker-tape parade. What else could we be celebrating? He looked up and saw a large gash in the side of the South Tower of the WTC; it was bellowing smoke and more paper — full-size sheets of paper. He picked one off the street; it was a contract. He picked up another one — someone’s resume. A stranger told him that he had heard something about a plane hitting the building. Belnap noticed a long line of people trying to buy disposable cameras at an adjacent photo shop and hundreds of the curious were moving toward the WTC. Belnap was tempted to follow the crowd, but felt compelled to walk the other way toward his office. “I had the most unmistakable push on my right shoulder to keep moving — a physical nudge,” he recalls. Belnap was one of the few moving upstream in this river of people. “I passed all these faces going the other way,” he says. “My natural inclination was to follow them.” Again, he felt as if someone pushed him on the back. “By the time I got to my building I was running all out,” he says. At his 15th-floor office, Belnap listened to the radio and learned that both towers had been hit by large airplanes in a terrorist attack. He called his wife and they talked briefly. At about the same time, a secretary screamed — one of the towers was falling. Co-workers moved away from the window, thinking the tower would fall sideways onto their building. Belnap and his co-workers were told to abandon their office and report to the basement. When word came that the second tower had fallen, they were told to evacuate the building. They gathered their belongings and disappeared into the cloud outside, heading east, away from the disaster. Not Belnap. He went back upstairs to his office on the 15th floor. Since arriving there in the morning, he had been calling local church leaders, trying to account for the well-being of 3,500 members of his stake. He also began arrangements to convert the stake center on the Upper West Side into a shelter. There were some 35,000 to 40,000 LDS Church members in the area, and like many who work in Manhattan they commuted 20 to 70 miles each day. With subways and tunnels closed, they were stuck on the island. Belnap, along with other local leaders, arranged to have the stake center stocked with provisions. It was now 1 p.m., and Belnap had been on the phone for hours, long after everyone had been told to leave and the lights and power were out. A few days later the New York Times would print a map showing where the phone outages had occurred; Belnap happened to work on the one block in lower Manhattan that had phone service. “That was providential,” he says. Belnap decided it was time to leave. He walked down 15 flights of stairs and encountered a security guard in the lobby, who was surprised to see Belnap. He gave Belnap wet paper towels to hold over his mouth and nose as he made his way north through the gritty air toward the stake center. After walking several blocks he emerged from the ash cloud into bright sunlight again. “It was like walking through a curtain,” he says. As he left the darkness, he encountered dozens of cameras filming the spot where people emerged. Belnap stared at the scene before him. As he continued north, shopkeepers offered food, water and use of a bathroom to passers-by. “Suddenly, New York was changed — it was a warm and nice place,” he says. Belnap finally reached the stake center, where he stayed late into the night, communicating with leaders in Salt Lake City and assisting efforts to track down church members. Within 48 hours, they had called more than 3,000 people. One man rode around on a scooter knocking on doors, but most of the contacting was done through a phone tree that had been established three years earlier. In the coming weeks Belnap was bombarded with requests from people wanting to help, as people turned their attention to healing and returning to normalcy. But he has never forgotten the lesson of that day. “It was a testament to being prepared,” says Belnap. Belnap said this while preparing for the arrival of Hurricane Irene. Duct tape, batteries and flashlights were popular items again. There were long lines to get water and batteries. Belnap’s office was empty. “It’s kind of happening again,” he said. NOTE CIA DANITE DOUG ROBINSON’S HAIRCUT: MUSHROOM CAP HAIRCUT. Mushroom cloud from the atomic bombing of Nagasaki, Japan on August 9, 1945. Although the term appears to have been coined at the start of the 1950s, mushroom clouds generated by explosions were being described centuries before the atomic era. A contemporary aquatint by an unknown artist of the 1782 Franco-Spanish attack on Gibraltar shows one of the attacking force’s floating batteries exploding with a mushroom cloud, after the British defenders set it ablaze by firing heated shot. The Times published a report on 1 October 1937 of a Japanese attack on Shanghai in China which generated “a great mushroom of smoke”. The 1917 Halifax Explosion also produced one. During World War II, descriptions of mushroom clouds were relatively common. The atomic bomb cloud over Nagasaki, Japan was described in The Times of London of 13 August 1945 as a “huge mushroom of smoke and dust”. On 9 September 1945, The New York Times published an eyewitness account of the Nagasaki bombing, written by William L. Laurence, the official newspaper correspondent of the Manhattan Project, who accompanied one of the three aircraft that made the bombing run. He wrote of the bomb producing a “pillar of purple fire”, out of the top of which came “a giant mushroom that increased the height of the pillar to a total of 45,000 feet”. 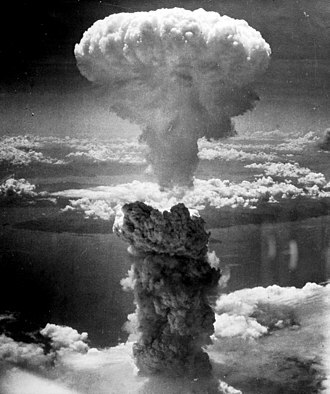 Later in 1946, the Operation Crossroads nuclear bomb tests were described as having a “cauliflower” cloud, but a reporter present also spoke of “the mushroom, now the common symbol of the atomic age“. Mushrooms have traditionally been associated both with life and death, food and poison, making them a more powerful symbolic connection than, say, the “cauliflower” cloud. Sometimes a box isn’t just a box. Prudential is composed of hundreds of subsidiaries and holds more than $2 trillion of life insurance. The company uses the Rock of Gibraltar as its logo. The stock market was down but is already climbing back up. It has to. The stock market is never going to crash. It’s just going to keep climbing and climbing and people are going to continue to be preoccupied with shopping and consuming and entertainment and other diversions and distractions tossed at them. Mormon CIA is on a roll! But everybody knows, civilized leaders do not plot attacks on the people, especially civilized corporate government religious leaders known to be “The Church of Jesus Christ”. How crazy of me to think such a thing as that! I’m crazy, obviously insanely green with envy, yes, that’s got to be it. Envious because I cannot afford one of the many new homes and apartments. Envious because I’m not young and pretty. FOR THE RECORD. There is a deliberate attempt to make it appear that 28 is a racist symbol among poor white males when in fact it is a symbol used by wealthy powerful new and improved Nazis including many Berkshire Hathaway (BH) investors. I confess, I am jealous. Very jealous! I’m trying to find at least one of the pictures I took of Beautiful musical (Carole King) advertisement on Big Belly garbage receptacle in front of Mormon Church of Satan’s Marriott Marquis de Sade hotel. Later today, when I go to Times Square, I will try to be as alert and focused as I possibly can, noting unusual passing vehicles and anything out of the ordinary, while making an important message from me announcement to theatergoers on line to see Mormon Church of Satan’s Hamilton musical and Mormon Church of Satan’s Donna Summer musical. The Washington D.C. Temple (formerly the Washington Temple) is the 18th constructed and 16th operating temple of The Church of Jesus Christ of Latter-day Saints (LDS Church). It is located in Kensington, Maryland, United States, just north of Washington, D.C., near the Capital Beltway. 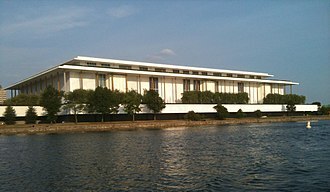 The John F. Kennedy Center for the Performing Arts (formally called the John F. Kennedy Memorial Center for the Performing Arts, and commonly referred to as the Kennedy Center) is the United States National Cultural Center, located on the Potomac River, adjacent to the Watergate complex in Washington, D.C., named in 1964 as a memorial to President John F. Kennedy. THIS IS AN IMPORTANT MESSAGE FROM ME: NO MORMON MOMENT MAGIC OF MACY*S, ALADDIN, HARRY POTTER … NO MAGIC/SORCERY/SATANISM CAN PREVENT THE IMPENDING STOCK MARKET CRASH, WORLDWIDE.